I'm back on the road - and to the east - Philly to be specific. Well, Allentown/Bethlehem to be very specific, but I stayed overnight in Philly. No one wants to stay overnight in Bethlehem. All of the sudden you're stuck in a La Quinta and it's one step above a manger....but without the amenities. As you can see from the above image, travel in the east did not go particularly well yesterday. Storms consisting mostly of ice went from Chicago to NYC and DC - and everything in between. Oddly enough, Cleveland was supposed to get hit, so to prep, I skipped my morning gym routine to build in extra time to get to the airport. I made it in 20 minutes on the bone-dry roads. So much for that forecast being nearly correct. 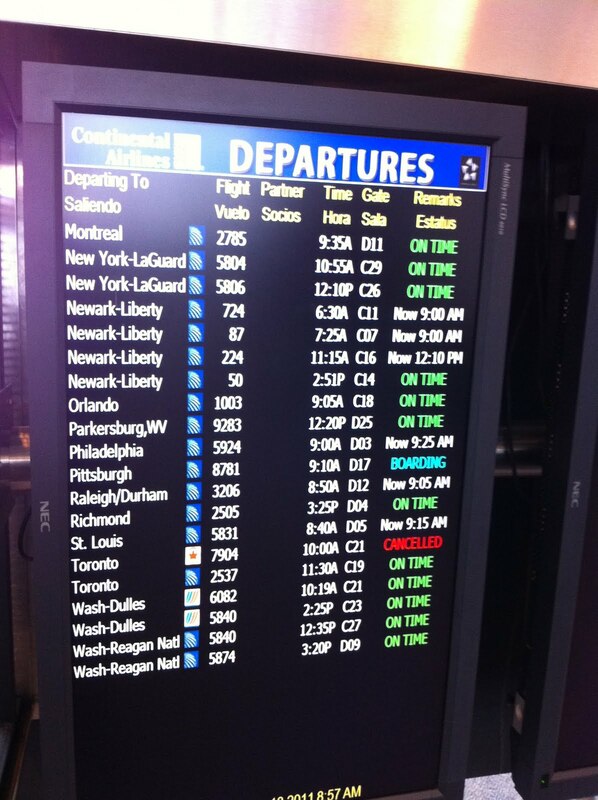 There were delays, but mostly for getting into Philly. 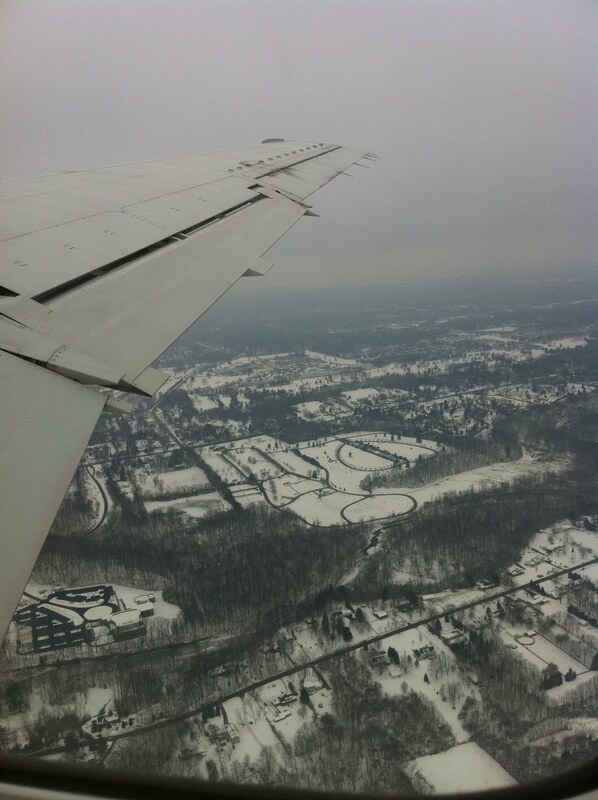 The plane boarded late, took off later and then we circled and circle and circled. And then we sat on the tarmac for another 30 minutes. I missed a lunch meeting with my team before a presentation - and arrived with like 15 minutes to spare - and an almost empty belly. I'm smart enough to pack food in my computer bag, but all I ate were two clementines and a granola bar. Oh, and the two packs of pretzels that the flight attendant gave me. The drive from the airport to my meeting wasn't horrible - no icy roads, but the spray from the other cars and trucks made you have the wipers on at high speed - and it was slow(er) going. The trip back was worse, but mostly because of rush hour. I saw that coming, which is why I spent last night in Philly. I knew I wouldn't make the last flight back to Cleveland based on how late the meeting was going and the commute. So I stayed and had dinner with a friend. More on that tomorrow. Here is the lovely aerial Ohio shot before everything clouded over. This was the least gloomy the trip would be - how sad is that? 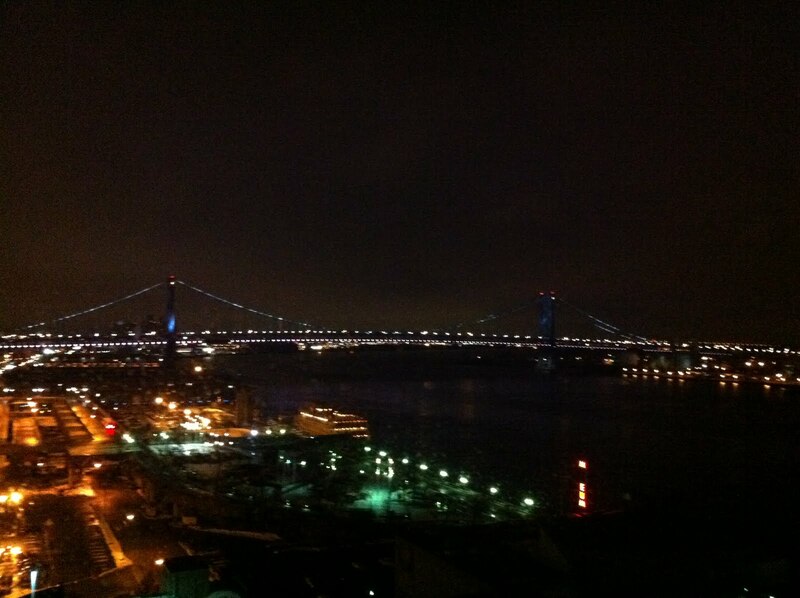 Here is the Ben Franklin Bridge - spanning from Philadelphia to Camden, NJ (one of the scarier places on earth!). Still, it's a nice view from my 14th floor hotel room. That's it. That's all I got. I still like work travel, it's just that days like yesterday frustrate me on not being able to get from point A to B easily. Ahhh...that Mother Nature.....she sure is a mother. I would love work travel if it put me in contact with distant friends. The only travel I do related to work is conventions—three in thirteen years. I swear, traveling is all the rage, eh? Fun, fun fun!!! Someone once told me he doesn't fly unless the distance is more than 1000 miles, which can be driven in 15 hours. By the time you factor in the time and aggravation of flying, it's faster and cheaper to just drive. Would you agree or disagree with that? I love the at night photograph. I never have seen the bridge from that angle. It is kind of amazing that with all the technology out there, including the really annoying Facetime app on my iphone, that people still prefer and in person meeting. In answer to KIng Cubby's travel question I would say 6 hours is really my tipping point, 7 to NYC. I second david about the night photo. philly's my hometown, and yet I never get to see something like this. and you are correct, camden nj IS a scary place! at one time, campbell's soup and rca victor records and phonographs were made there. without sounding bad. I would love to stay in Bethlehem with you, but I am afarid you woul dnt get any sleep. You are a HOT Man. Any more pictures of you?? I have never traveled for my work. it must be something to do so. I rather envy this. however, most workers who travel tell me it is not so glamorous as I imagine it to be.